This is another site on the footpaths of mumbai. they are the places where the BEST buses are supposed to stop. But the buses whose drivers are either late to break or forget about the stop break there vehicles at the last minute making the bus stop with a screeching noise. And poor passengers in the buses have to have a good grip on themselves. The bus-stop seen here was shot at 7 in the morning so it is empty otherwise it and other stops in the city will have a minimum of 7 or 10 people waiting to board a bus. On top side of the stop seen in the pic are some numbers. These are the route numbers which stop here. On the exact opposite the same numbers are written in hindi. 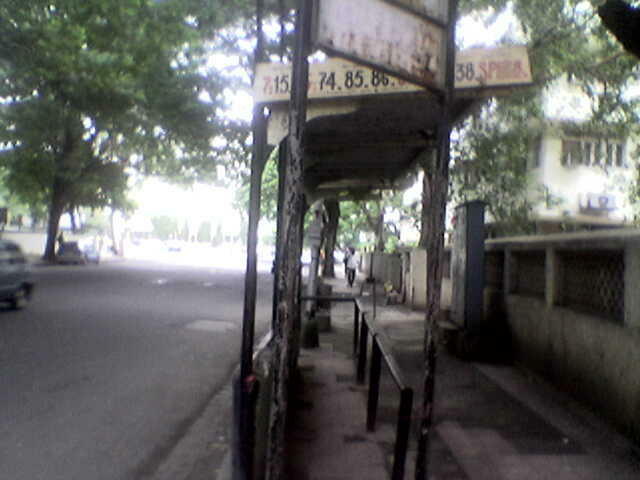 Some bus-stops are used for the obvious purposes like bus stopping, but some bus-stops are used by some beggers to live there. The bus-stop is also a good meeting spot. Boyfriend meets girlfriend or girlfriend meets boyfriend stand here for hours talking. Some of these bus-stops are landmarks. Happy waiting for the BEST buses on the best stops. where is this bustop ?